Palm Beach Gardens Predators follows a researched and proven approach to player development. 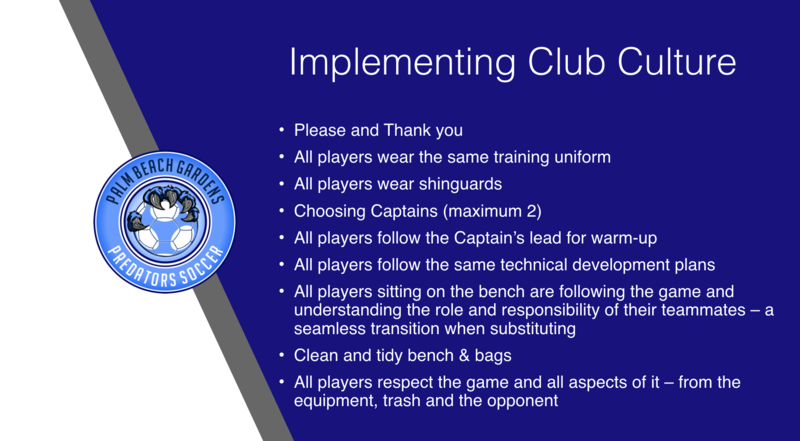 The following information introduces our philosophy, player development rationale and the methods that are used to deliver our curriculum. 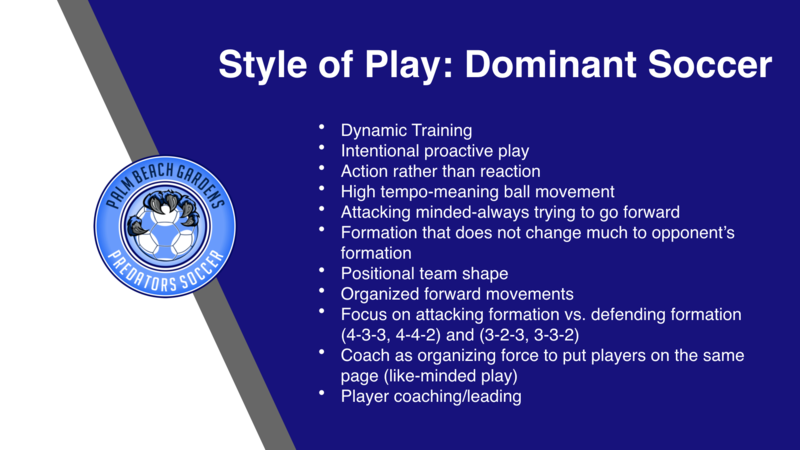 To develop, promote and transition every Predators player to the level they desire and wish to achieve. 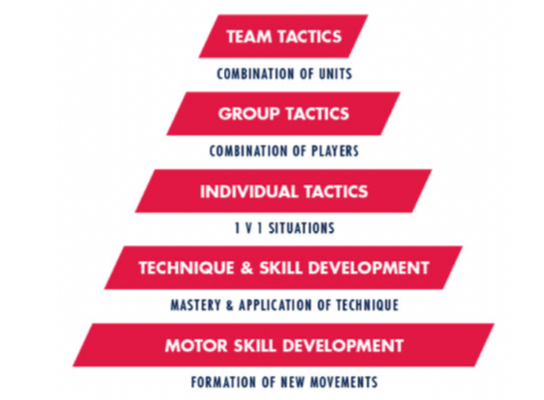 To identify promising young soccer players, introduce them to a professional soccer environment with the purpose to develop and promote the most talented players to the US Youth National Team system and to our Academy partners. Palm Beach Gardens Predators take on the building block approach to Player Development. 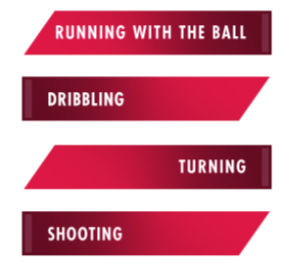 Players follow an initial path heavily focused on technique and skill development, and as competency increases tactical elements are introduced. Within each building block an extensive curriculum is designed to focus on the necessary skill set. Proficiency within each block is important to ensure that the player has acquired the required skills to support their development at the next stage of the curriculum. Each building block is tied closely together. As a player progresses through the system they will continue to work on elements of preceding stages to ensure they are consistently and simultaneously challenged on both fundamental and advanced levels. The best way to improve technique is through constant repetition and high volume of contact with the ball. Games provide very limited technical benefits since players don’t get many touches on the ball. When you have 18 players sharing one ball, each player only gets on average 20 - 40 ball touches per game. In fact, depending on position and amount of minutes played, some players only touch the ball 10-20 times per game (or less!). This is not our philosophy of developing players. In a well structured practice that is geared towards technical development, players would typically touch the ball hundreds of times in one single practice. By keeping the player-to-ball ratio small (1:1 through 4:1) and using small-sided games, each player would easily accomplish 200-400 touches, and often even more, in a 75 minute practice session. 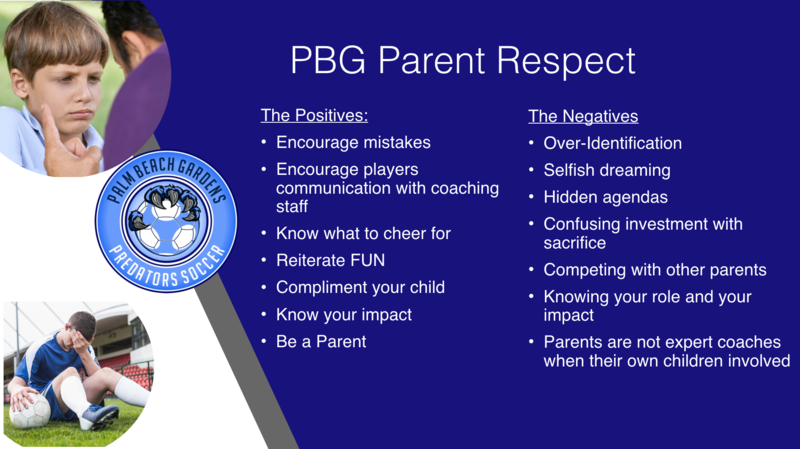 Our goal at PBG Predators is to provide players an environment where they can get challenged, learn, and excel so they can achieve their potential. Ensure every player has touched the ball a minimum of 500 times by end of warm up! 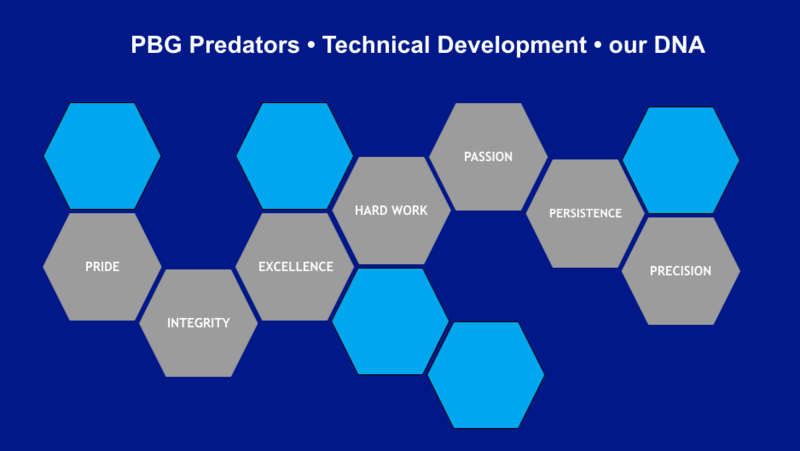 The Palm Beach Gardens Predators – Youth Technical Curriculum’ is designed around 4 key topics of technical development. Encourage creativity – allow players to express themselves!